Your stay in a B&B, on the beachfront or at the foot of the mountains, in town or village in the countryside, is a great way to discover the Basque Country and its landscapes, traditions, folklore, culture and gastronomy. 3 km from Saint-Jean-de-Luz, guest rooms within the castle walls, fully furnished and decorated with paintings and 18th and 19th century furniture. All rooms have air-conditioning and satellite-TV. Park and swimming-pool. A traditional Basque guesthouse surrounded by a parkland with an outdoor swimming pool. Ideally located between Ocean and Mountains, the Iparra B&B has 4 spacious and comfortable guestrooms in the beautiful village of Arcangues, near Biarritz. 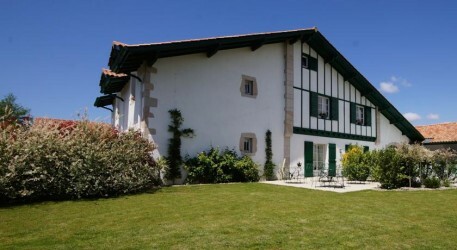 The Maison Irigoian, is a 17th century Basque house, on the Ilbarritz golf course and 300 m from the beach. Heated indoor pool (20m x 3m), hammam, fitness, massage, aquagym.